Get dependable Canon PG-40 and CL-41 Compatible black & colour ink cartridges for less at InkColour. Each cartridge is remanufactured and holds 18ml of deep, vivid ink. 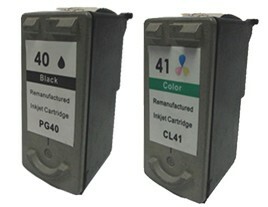 Canon CL-41 Compatible cartridges include all three colours needed to reproduce the spectrum: magenta, cyan and yellow. By design, these cartridges meet all specifications of the compatible Canon photo and all-in-one inkjet printers. Compatible Canon PG-40 and CL-41 black & colour ink cartridges are capable of producing hundreds of sharp, true-colour photos and crisp, black and white copy for presentations and other documents. Highly pigmented ink lasts and resists smearing, even when highlighted.